Nothing says British summertime quite like blackcurrants. The shiny little fruits pop up on bushes in gardens across the UK from around early July up until the end of August, making them a favourite of keen gardeners. Shops will stock up on punnets of the berries during the season too, making them readily available for all sorts of delightful cooking. 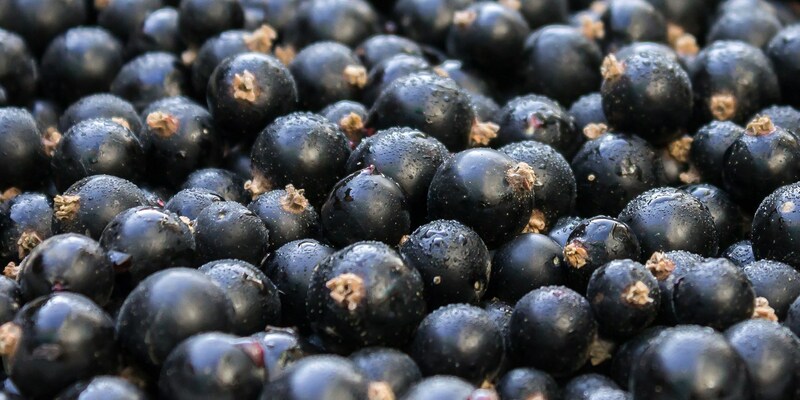 Our collection of blackcurrant recipes shows that the fruits can be used for so much more than flavouring the drinks of our childhood. Their sweetness naturally makes them perfect for desserts, providing a perfect flavouring for Fruit pastilles and chilled sweet soups (as in this Blackcurrant and cherry soup recipe). Try Victoria Glass’ Brown bread ice cream with blackcurrant curd ripple, which doesn’t just have a wonderful flavour – it also means you can continue enjoying blackcurrants after the season ends. James Sommerin turns the berries into a sorbet for his Lemon curd with blackcurrant sorbet, oatmeal and mint glass, while Marcello Tully uses them to flavour a coulis for his Crème fraîche panna cotta with orange and mint sorbet. Blackcurrants can work in a savoury context too, providing contrast to saltier, umami-rich ingredients – just take a look at Russell Bateman’s Bresaola of silverside with blackcurrants, ricotta and rocket to see how. Do get preserving these little beauties too – they’re perfect for flavouring gin, freezing or turning into syrups.